ArtistWorks offers three types of gift certificates available for purchase: eGift, Print at Home, and Mail. If you would like to include a personal message, be sure to customize your response when selecting eGift or Print at Home before adding to your cart. 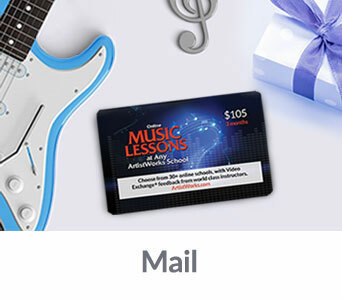 ArtistWorks is committed to helping everyone become the best musician they can be, and Video Exchange Learning® allows our teachers to guide that progress. Advance your music studies by joining our supportive community or give music as a gift to your friends and family. Each instrument has a massive lesson library that covers the fundamentals, advanced techniques, and key learning strategies; memberships include music theory and acoustic guitar lessons too. From drums to guitar, our virtuoso teachers offer high-caliber instruction to the entire world.